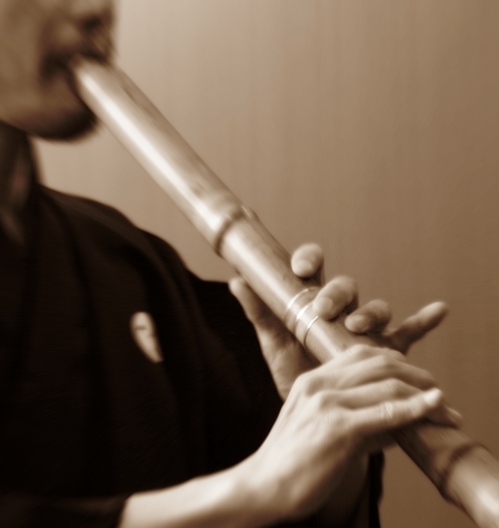 The shakuhachi is certainly Japan’s most well-known woodwind instrument. It takes its name out of “one shaku eight sun” (almost 55 centimeters), the standard length of a shakuhachi. You might like to get into the mood of shakuhachi sound while you’re reading this post ^^, so here is a video with a shakuhachi playing. The practice of this instrument was introduced from China in the 8th century by a japanese priest that was studying the instrument and then brought to Japan n his return. 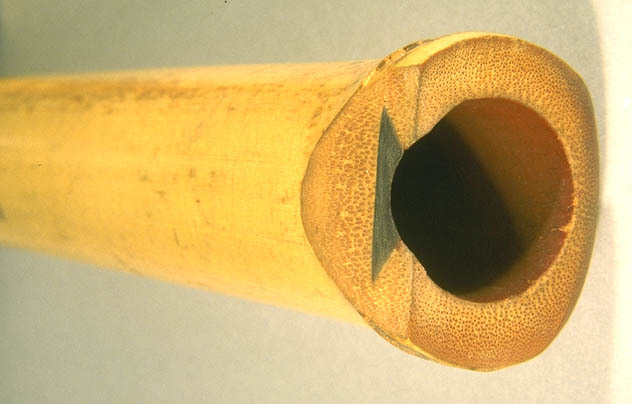 It is made from the lowest section of the bamboo and the average diameter of the pipe is 4-5 cm. The inside of the pipe is almost cylindrical and the length varies according to the pitch of the ensemble of Koto and Shamisen, as it used to play along these instruments. Five finger-holes, four in front and one on the back, give the following six tones in the standard pipe, d (closed), f, g, a, c, d’ though controlling the angle of the mouthpiece against the lip, all of the twelve tones can be produced. The mouthpiece at the top of the pipe is made by cutting the edge diagonally toward the outside. This type of mouthpiece makes it possible for the player to control the pitch by changing the angle, which in turn produces a delicate change in intonation not possible on a Western recorder (Blockflote) having a whistle type of mouthpiece. Here you can watch how it is made. 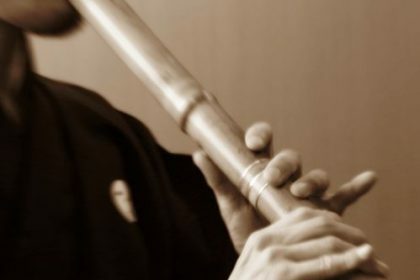 By the 7th century, the shakuhachi was part of the instruments used during the representations given at the court (Gagaku) until the 9th century when it was taken out from the orchestra. Wind, string and percussion instruments being played in gagaku music. 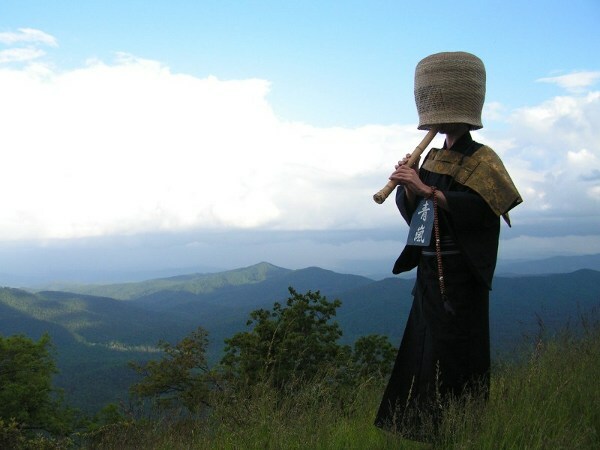 During the medieval period, the shakuhachi was most notable for its role in the Fuke sect of Zen Buddhist monks, known as komusō. 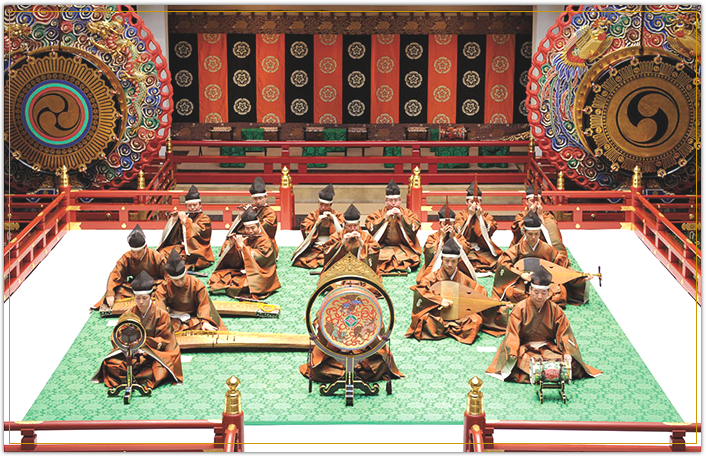 It was introduced by the Grand Master Hottô Kokushi and monks used the shakuhachi as a spiritual tool. Their songs were called honkyoku. Monk of the Fuke sect of Zen Buddhist, known as komusō. With the Meiji Restoration, beginning in 1868, the shogunate was abolished and so was the Fuke sect, as it had worked together with the shogunate. 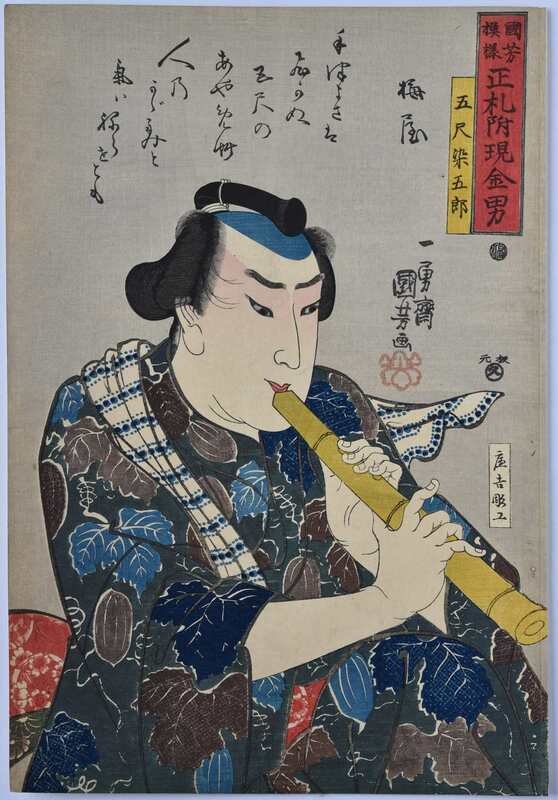 The very playing of the shakuhachi was officially forbidden for a few years. The honkyoku repertoire was known exclusively to the Fuke sect and transmitted by repetition and practice, and much of it was lost, along with many important documents. 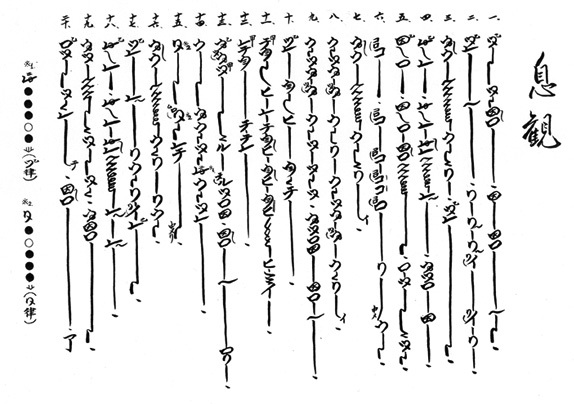 A transcription of a Honkyoku piece. 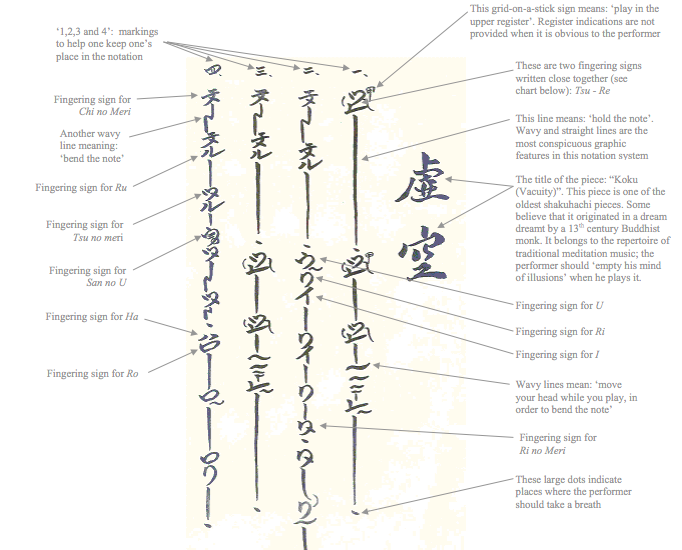 Being free rhythm the main element in a Honkyoku piece, transcriptions preserved today are only an approximation of how the piece should be performed. 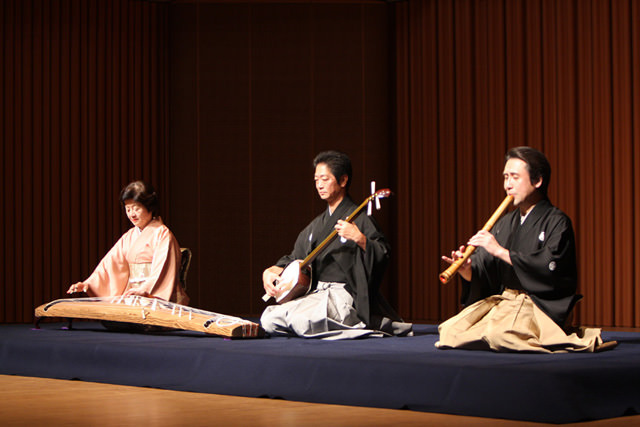 Koto, Shamisen and Shakuhachi performed together. Many schools were opened to continue the practice of the shakuhachi. With great variety of styles, they contribute to enrich and develop the repertory of this instrument. These same schools gave rise to many other modern schools. Next video is a song played by Rin’, a Japanese pop group which combines traditional Japanese musical instruments and style with elements of modern pop and rock music. 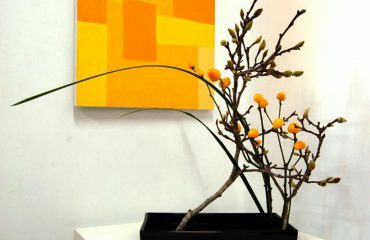 The sound of the shakuhachi is warm, woody, sweet and pure. 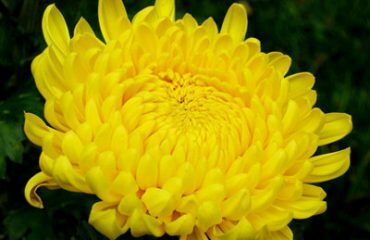 It is very dramatic with its intense dynamics. The breathy pitch bends and piercing attacks makes it a very special instrument both for the perfomer and the audience. Quick question. 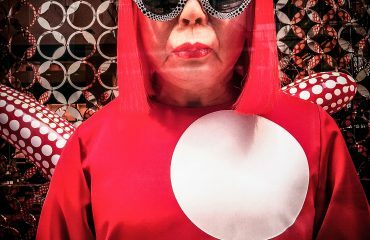 Would you know if the image that you have used with the three member ensemble is a a royalty free image? Or if it is a stock image, can you please share the source? I am looking for images for an exhibit on musical instruments.